W e at Gravity Wine House know that winery sanitation is fundamental in maintaining wine quality. Microorganisms cannot be seen by the naked eye and although a piece of equipment might look clean, without proper sanitation there might be organisms present on the surface that are detrimental to wine quality. For this reason, we validate our sanitation procedures by performing monthly checks with an ATP monitoring system. Our program involves swabbing multiple areas around the winery (before, during and after operations) in order to give us a picture of the winery’s overall cleanliness. ATP (adenosine triphosphate) is the molecule that functions as the universal energy driver present in every cell of organic matter. 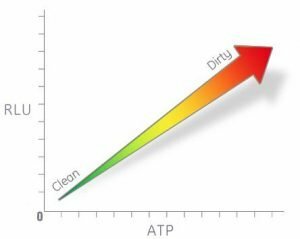 Given that ATP occurs within all cells of life, we can thus use this information to test for the presence of cells in the production environment that may cause contamination. Any wine product or microbial cells left behind on surfaces after sanitation procedures have been performed may be a risk factor for contamination. Some common spoilage organisms that occur within a winery are Lactobacillus, Acetobacter, Brettanomyces, and Pediococcus. There are other organisms not considered spoilage, per se, but whose presence should absolutely be followed around the winery, such as all yeast cells and Oenococcus. All of these organisms, under the right circumstances, may cause the undesirable characteristics of off-flavors and aromas, haziness, volatile acidity, and possible re-fermentation in the bottle. These organisms are able to grow and thrive in wine despite the nature of its low pH and high alcohol content. ATP tests can provide early detection of contamination problem areas, validate sanitation procedures, and ultimately protect wine quality and brand reputation. How do we Test for ATP? ATP is detected using the bioluminescence method. This procedure involves swabbing a small surface area (10 cm x 10 cm) and inserting the swab into a luminometer that quickly provides a reading. The bioluminescence method utilizes a biochemical reaction involving ATP and the luciferase enzyme, which is naturally occurring in fireflies. With oxygen as the catalyst, luciferase reacts with any ATP absorbed by the swab and produces a light output. This light is then quantified into RLUs (Relative Light Unit), which is displayed as the “relative” reading for the amount of ATP present. The RLU reading is directly proportional to the amount of ATP present — meaning the higher the RLU reading, the higher the amount of ATP that was detected, and thus the higher number of cells present. This relationship is an indication of the cleanliness of the surface tested. Although ATP swabbing gives us a good look at the total quantity of cells left behind after sanitation, this type of assay only signals either the presence or absence of cells. ATP tests do NOT distinguish between microbial and organic matter cell type. An RLU reading above zero signifies the presence of ATP; however, the ATP source could have originated from cells of wine product residue (grapes, juice, wine), bacteria, or any other organic material that may have come in contact with the surface. ATP presence only implies uncleanliness and a possibility for contamination. On the other hand, an RLU reading of zero does not mean the surface is sterile. Sterility implies the complete absence of all living bacteria. Given that the ATP test cannot differentiate between microbial cells versus wine product cells, we cannot assume sterility if the RLU reading is zero. When Should You Test for ATP? Given that the ATP assay does not distinguish between organic material and microbial ATP, we use the test results to validate the relative cleanliness of surfaces after performing sanitation procedures. Other microbiological tests can be performed if the knowledge of specific organisms is desired. 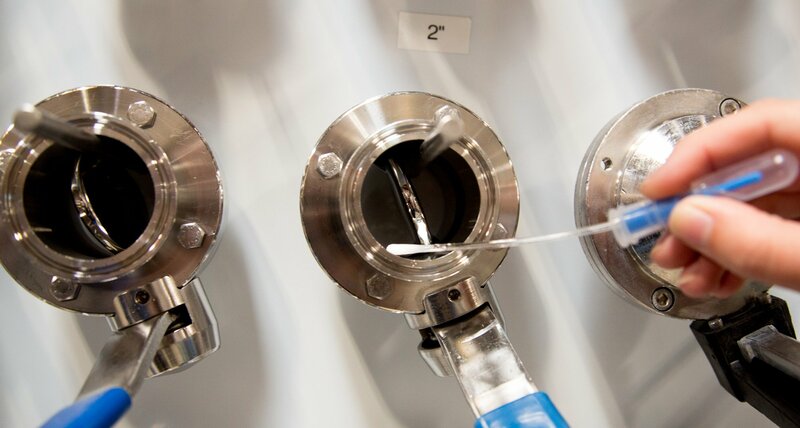 The most important surfaces to test for ATP are direct or indirect product contact surfaces including tanks, pumps, hoses, valves, bottling lines, etc. Special attentiveness should be applied to hard-to-clean areas such as irregularly shaped objects, grooves, and corners. The best time to perform the swab test on these areas is immediately following the sanitization of a tank or right before wine is being transferred into it. Test the valves, hoses, or any area that the wine may come in direct contact with (especially hard-to-clean areas that might have been missed). If the results are unsatisfactory, you now have time to re-sanitize before the wine comes in contact with possible contamination microbes. We perform monthly checks with an ATP monitoring system which involves swabbing multiple areas around the winery (before, during and after operations) in order to give us a picture of the winery’s overall cleanliness. ATP monitoring can be an extremely useful tool when creating a map of hot-spots or trouble areas for contamination within the facility. Keeping track of contamination incidents is often difficult when the site or source of contamination is unknown. Wine that has become contaminated may not be discovered until well after the initial contamination occasion. Implementing a thorough sanitation program is key to maintaining a clean facility and upholding wine quality. Having a verification procedure should be included in the sanitation program to act as a self-check to ensure the program is effective. By documenting areas where the sanitation has failed and the ATP result is deemed unacceptable, you can begin to create a map of when and where these potential contamination sites might occur. With enough of this data you may begin to discover trends and be able to point out exactly why the contamination issue or process error is occurring, and therefore prevent further contamination. Thorough and effective sanitation is crucial in winery production as it allows us to produce high-quality wine that is also safe. There are many benefits to using ATP swabs as an environmental monitoring procedure that can verify your sanitation practices. Although the results of these tests are not microbiologically specific, we are able to gain a quick glance at the overall picture of cleanliness. This method can also be utilized as intensely or casually as is practical for each production facility. While ATP monitoring is not currently required for wineries, we at Gravity Wine House take advantage of its many benefits. We take pride in our cleanliness and attention to detail, which both stem from the overarching goal — to provide the best (and cleanest) space for our clients’ wine.